The following is the third and final part of an email interview I recently conducted with Emily Hauth, project manager with Portland Bureau of Environmental Services (BES)’s Sustainable Stormwater Management Division. 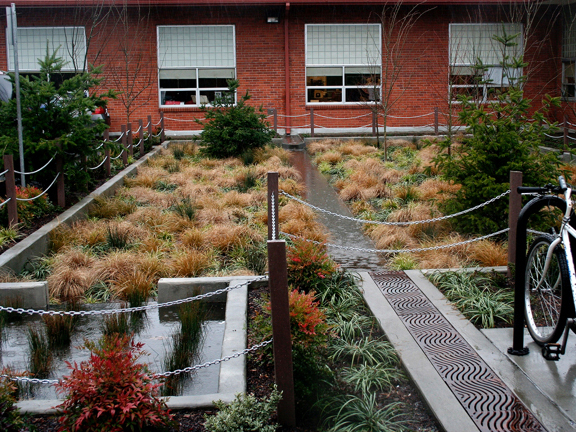 Their agency has been a leader in sustainable stormwater implmentation over the last twenty years. Green Infrastructure Digest (GrID): When it comes to new construction or public projects, it is much easier to require and/or encourage the use of green infrastructure best management practices. Existing development has proven to be much harder, what strategies has the City used to encourage existing developments to retrofit their properties to include green infrastructure and reduce/cleanse stormwater runoff? Community Watershed Stewardship Program (1995-present) – provides grants of up to $10,000 to schools, churches, businesses and other community organizations for projects that connect people with watersheds and protect and enhance watershed health. Willamette Stormwater Control Program (2001-2003) – The city offered financial grants and technical support for several projects to retrofit existing commercial properties served by the combined sewer. This was to research the feasibility, cost and performance of commercial sustainable stormwater approaches. The city distributed about $350,000 to 11 projects. 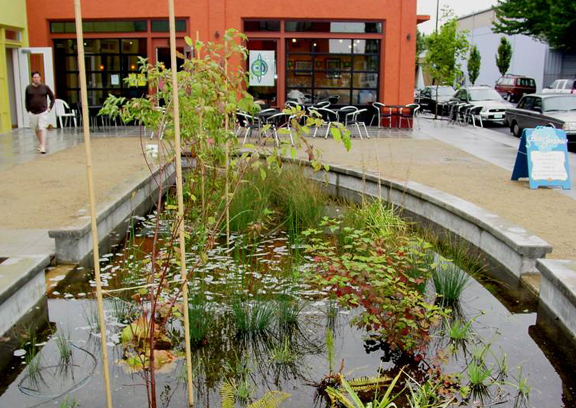 Innovative Wet Weather Program (2002-) – promotes stormwater management projects that contribute to healthy Portland watersheds. Between 2002 and 2005, the U.S. Environmental Protection Agency (EPA) granted the city $2.6 million to fund over 25 innovative public and private projects throughout the city that demonstrate sustainable, low-impact stormwater management solutions. Clean River Rewards (2006-present) – a stormwater utility discount program for private property owners who manage stormwater on their property. They can receive a discount of up to 100% of their on-site stormwater management charge. Grey to Green Program (2008-) – The city offers incentives of up to $5 per square foot to add new ecoroofs. The city also offers treebates to encourage people to plant eligible yard trees. The treebate is a credit on the recipient’s sewer bill of up to $40 per tree ($50 for native species). Private Property Retrofit Program (2009-) – The Tabor to the River Program offers design assistance and construction dollars for on-site stormwater management on targeted private properties. The program is available only in areas where stormwater retrofits will allow the city to avoid more costly sewer replacement projects. The city will install rain gardens, stormwater planters, swales or ecoroofs on sites that meet program criteria at no cost to the property owner. Property owners who want to install a facility themselves could qualify to receive financial incentives and technical assistance. 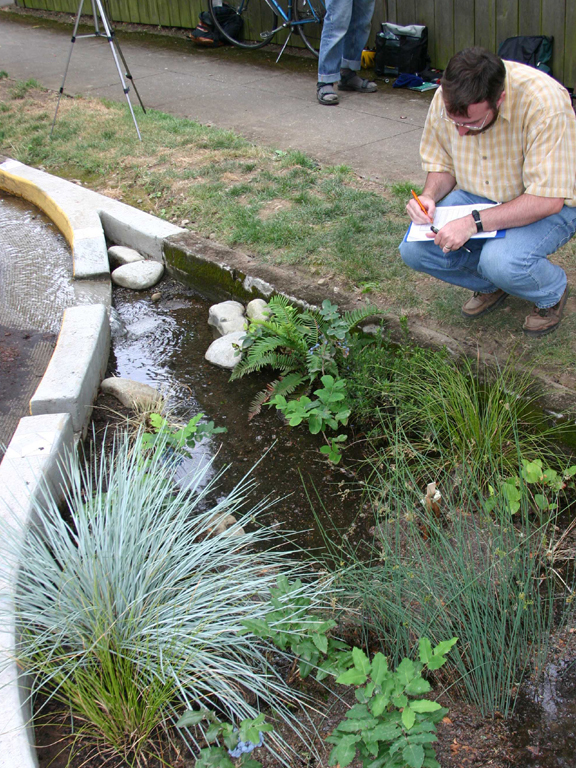 WorkingGreenPortland.com (2009-) – includes information on private property stormwater management technique, calculators to determine impacts for individual properties, and links to stormwater retrofit professionals and other resources. Ecoroof Floor Area Ratio Bonus – Development proposals in the central city that include a green roof, can receive bonus floor area. Education and Outreach – Numerous efforts to engage communities and increase public understanding and acceptance are critical to the success of all city programs. Technical Assistance – the city offers technical assistance to professionals and property owners for implementation of sustainable stormwater management approaches. GrID: What do you see as the future of green infrastructure? Green connectors – streets that connect parks and open space, schools, and commercial areas to neighborhoods; encourage walking and biking by providing enhanced and safer pedestrian and/or bicycle routes; and provide environmental benefits. Green refuges within our urban environment – reclaiming unused spaces or derelict sites within our cities for stormwater management and passive recreation. Ecodistricts – integrated neighborhoods that capture, manage, and reuse a majority of energy, water, and waste on site; offer a range of transportation options; provide a rich diversity of habitat and open space; and enhance community engagement and well-being. Volunteer Green Street Maintenance Program – engaging community members to help in the care and maintenance of green streets. Possible onsite stormwater management discount to property owners for adjacent public green streets. Cost benefit analysis of the ecosystem services provided by green infrastructure in meeting the triple bottom line. If you missed the first parts of the interview, you can find them here. The following is the second part of an email interview I recently conducted with Emily Hauth, project manager with Portland Bureau of Environmental Services (BES)’s Sustainable Stormwater Management Division. Their agency has been a leader in sustainable stormwater implmentation over the last twenty years. She would like to credit Tim Kurtz, engineer at BES with the following responses. Green Infrastructure Digest (GrID): What role do green streets play in the City’s overall stormwater management strategy, particularly their role in addressing stormwater overflows in your CSO districts as compared to the big pipe projects (i.e. Columbia Slough Big Pipe, East Side Big Pipe, West Side Big Pipe)? What lessons have you learned over the course of implementing your green streets projects? Mr. Tim Kurtz: Our CSO control program began in 1991. We are completing construction of our third large CSO tunnel to help us complete the program by the mandated deadline of 2011. But several projects to reduce CSO volume by removing stormwater from the combined sewer system are very important to the CSO control effort. For example, we have disconnected thousands of downspouts from the combined sewer system since 1995. It’s a relatively low-cost CSO solution but it’s a major part of our green infrastructure. Downspout disconnections remove more than 1.2-billion gallons of stormwater annually from the combined sewer system. Green streets will play an important role in ensuring that our new CSO tunnels remain under capacity as new growth and development increase stormwater volume in the future. 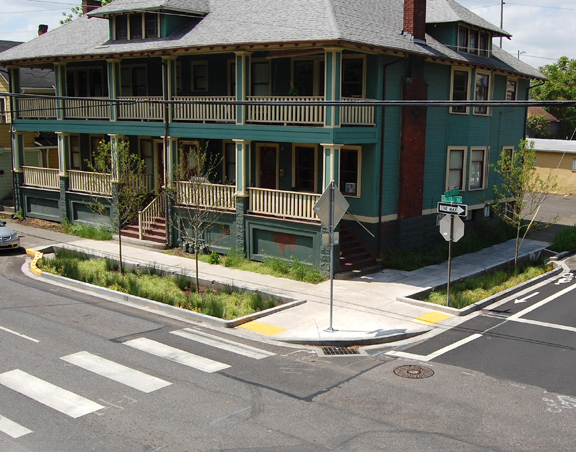 Green streets also help alleviate basement flooding from sewer backups in neighborhoods with combined sewers; they are a good alternative to sumps and sedimentation manholes, and they are an important tool in meeting water quality requirements in Portland’s urban streams. We use Green Streets and other stormwater management facilities to meet different needs such as improved water quality, flow control, and complete infiltration. We’ve learned that soils can be a determining factor in how our facilities are constructed to meet our different goals. On Portland’s east side, soils typically meet our infiltration rates (>= 2 “per hour) but often require underground rock storage to meet complete disposal goals. On the city’s west side, where soils are much tighter, we typically line facilities to meet water quality goals. GrID: With the recent Portland Tribune article regarding the 44th Avenue and Seymour Street Green Street Project, what is your process for implementing a green street project? To what extent do you involve the public in the design/location of the facilities? Mr. Kurtz: The outreach process for green street implementation always includes property owners affected by a green street facility. With all projects, we meet with adjacent property owners, attend neighborhood and business association meetings, offer presentations to groups, distribute informational publications and host green street tours. At 30% design, the city sends information to adjacent residents for small projects or all project area residents for larger projects. At 90% design, the city mails notification to all project area residents of upcoming construction. Depending on project needs and priority, there may be flexibility in facility type and location. But the city determines the final design to meet system needs. Adjacent property owners can choose from a set of planting templates, with the opportunity for some customization. The public has responded positively to this hands-on approach to explain the benefits and cost savings of green streets. More than 100 citizens have called to ask the city to install a green street facility next to their homes. Of course, not all property owners are supportive, as is the case along SW 44th and Seymour. We view this public process also as an opportunity to receive feedback, both negative and positive, and work to address the issues. The following is the first part of an email interview I recently conducted with Emily Hauth, project manager with Portland Bureau of Environmental Services (BES)’s Sustainable Stormwater Management Division. Their agency has been a leader in sustainable stormwater implmentation over the last twenty years. 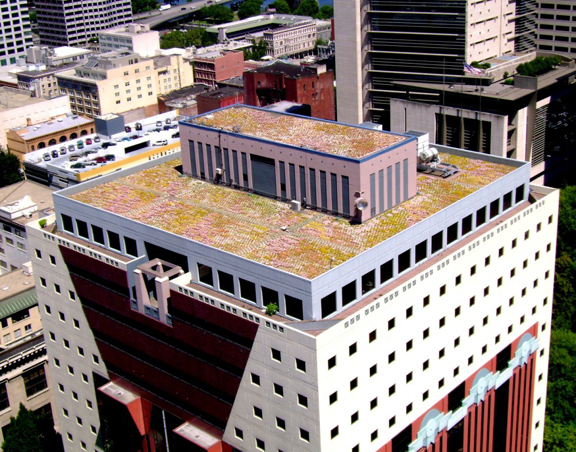 Green Infrastructure Digest (GrID): The City of Portland has been and continues to be a leader in implementing green infrastructure facilities. Please tell our readers a little bit about the work the Bureau of Environmental Services (BES) is doing in regard to increasing the use of green infrastructure. What new innovations should we expect to see out of BES in the coming years? Ms. Emily Hauth: Our sustainable stormwater management solutions have evolved from a single purpose regulatory driven approach to one that achieves multiple objectives. We are designing our urban landscapes and street systems with an eye toward community enhancement, cooling of the air and water, increased wildlife habitat and greenspace, safe bike and pedestrian linkages, greenway connections to services and amenities, and of course capturing and treating stormwater at the source on the surface. In this way we are achieving watershed health goals and meeting regulatory compliance while informing a new approach to urban development. We are incorporating green infrastructure approaches into our policy development and planning processes. We have a number of policy initiatives that recognize green infrastructure solutions as a smart way to plan for watershed health and the city’s future and direct city bureaus and agencies to cooperatively plan and implement green infrastructure elements as part of all work programs. Our bureau works collaboratively with other City bureaus and agencies such as our Bureau Of Transportation and the Portland Development Commission on projects that promote environmental concepts while addressing auto, pedestrian, and bicycle safety. We are also fully integrating our watershed health and stormwater/sanitary collection goals into our Systems planning process. 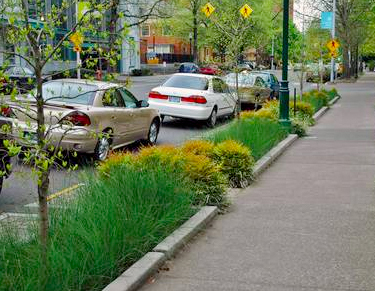 Portland’s Grey to Green initiative, established in 2007, sets a 5-year goal to increase green infrastructure elements throughout Portland including 900 Green Streets, 43 acres of Ecoroofs, and over 50,000 new trees. In one particular area of the city where pipes are failing or undersized, we are incorporating green street facilities into the solutions plan. This area is referred to as Tabor to the River. In this area alone, we will be constructing 500 green streets. We’re also working closely with targeted private property owners to help them manage stormwater on their sites and play a role in the solution. All future work to address similar issues will follow this model of combining grey and green infrastructure solutions. We don’t feel we have all the answers so we continue to ask ourselves, is it working? We continue to monitor our facilities, modify designs, research components such as plants and soils, to refine our knowledge base and maximize facility function and performance. We’re always looking for efficiencies in design and construction so we’re evaluating use of modular or prefabricated components for sustainable stormwater solutions. Other innovations we’re exploring include using a curbless green street design, new design options that manage both public and private runoff, and green walls that manage stormwater. We’re also developing a volunteer green street maintenance program that engages the community while helping the city meet its maintenance needs. In Wednesday’s post, I mentioned the benefits of monitoring to help explain the reasons why green infrastructure facilities are being employed in their neighborhoods and specifically their effectiveness in improving water quality in our rivers and stream for which we all depend. 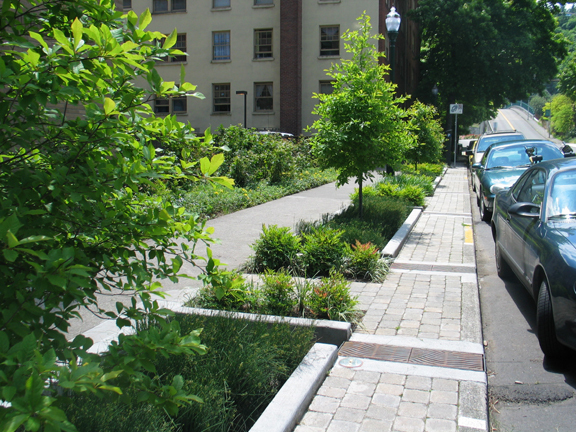 The City of Portland has done a great job at monitoring their green streets and other green infrastructure facilities. They provide this information on the Bureau of Environmental Services’ (BES) website. Their 2008 evaluation of their green street facilities have shown that for a 25-year storm event ( 25-yr, 6-hr) that peak flows were reduced by 80% or more. For CSO compliance events, their studies were shown to capture 60% or more of the storm volume. These number continue to be supported through researched conducted over the last decade. The concern that the accumulation of these pollutants, particularly metals will pose health risk have been unsubstantiated. A four-year study by Philip Jones (student) and Dr. Allan Davis (advisor) at the University of Maryland, showed the level of pollutants that accumulated within a bioretention cell on campus to exceed soil background levels but were far below EPA cleanup standards. It is important to remember that currently, most conventional stormwater devices have no capacity to address pollutant removal. Portland is at the forefront in implementing green infrastructure practices and will be well positioned as Federal standards continue to be strengthened over the coming decade. More importantly, they are improving the water quality of their rivers for future citizens. If fact, the EPA recently announced they are conducting stakeholder input in an effort to initiate a national rulemaking that would establish a comprehensive program to reduce stormwater discharges from new development and redevelopment and make other regulatory improvements to strengthen its stormwater program. At a minimum the EPA intends to propose a rule to control stormwater from newly developed and redeveloped sites, and to take final action no later than November 2012. Streetsblog San Francisco had a great post last week that reported on a recent tour of Portland’s Green Streets taken during the Congress for the New Urbanism’s Project for Transportation Reform Conference. The post includes a number of wonderful green street examples. The quality of the installations are impressive. A representative of Portland’s Bureau of Environmental Services (BES) was quoted as saying the green streets were necessitated as a result of the City’s need to comply with a Clean Water Act lawsuit. The cost of conventional stormwater infrastructure topped nearly $150 million. This cost encouraged the city to explore alternatives like green streets for reducing water volumes. David Elkin,the BES representative quoted in the post, estimates the solution saved the City $60 million dollars in stormwater pipe replacement. The post is worth checking out.